JULY, 1970 - British Leyland Motor Corporation announced in England on June 9 that Triumph, one of the world's most successful builders of two-seater sports cars, will build an entirely new 3-liter V8 powered luxury Grand Touring model. This will be in addition to its well-known line of sports models; the Spitfire, GT6+, and TR6. Called the Triumph Stag, it is a 2-door, 2+2 coupe available in convertible, hard-top or combined convertible / detachable hard-top form, and is in the $5,000 price class. The new Tripmph Stag is to be supplied initially to the British home market, with an American specification version available late this year. The engine, a 2997 cc. (182.9 cu. in.) V8 is an entirely new high efficiency power plant delivering 145 bhp at 5,500 rpm. Performance is "sparkling" according to European press, with maximum speed of 120 mph, making the Stag Triumph's fastest car. Equipment is particularly lavish and styling is by Giovanni Michelotti of Italy. The car has a long, low, sleek profile with the front and rear end styling treatment bearing a family resemblance to other Triumph models. Such items as power steering and electrically operated windows are standard. Either automatic, or manually controlled transmission with overdrive, is available. Air conditioning is optional. The individual front bucket seats not only adjust fore and aft and are fully reclining, but also adjust for height and rake by a separate handle control. The rear seat is fully upholstered and is larger and more comfortable than many "so-called" 2+2's. Instrumentation is very complete, and the padded steering wheel adjusts both up/down and in/out. All models are equipped with a convertible top, which when folded, is concealed under a deck lid. There is a uniqe T-shaped safety padded roll bar, making for massive strength. This is concealed when the optional hard-top is fitted. 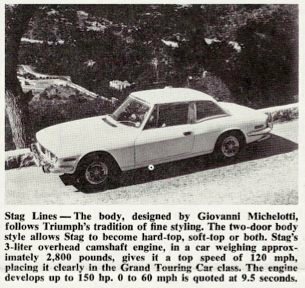 "Stag Lines - The body, designed by Giovanni Michelotti, follows Triumph's tradition of fine styling. The two-door body style allows Stag to become hard-top, soft-top, or both. Stag's 3-liter overhead camshaft engine, in a car weighing approximately 2,800 pounds, gives it a top speed of 120 mph, placing it clearly in the Grand Touring Car class. The engine develops up to 150 hp. 0 to 60 mph is quoted at 9.5 seconds." Comments on "Triumph Stag Introduction 1970"